As described at the Historical Construction Equipment Association website: "Haiss Brothers Coal Company was founded in New York City, New York, in 1888. 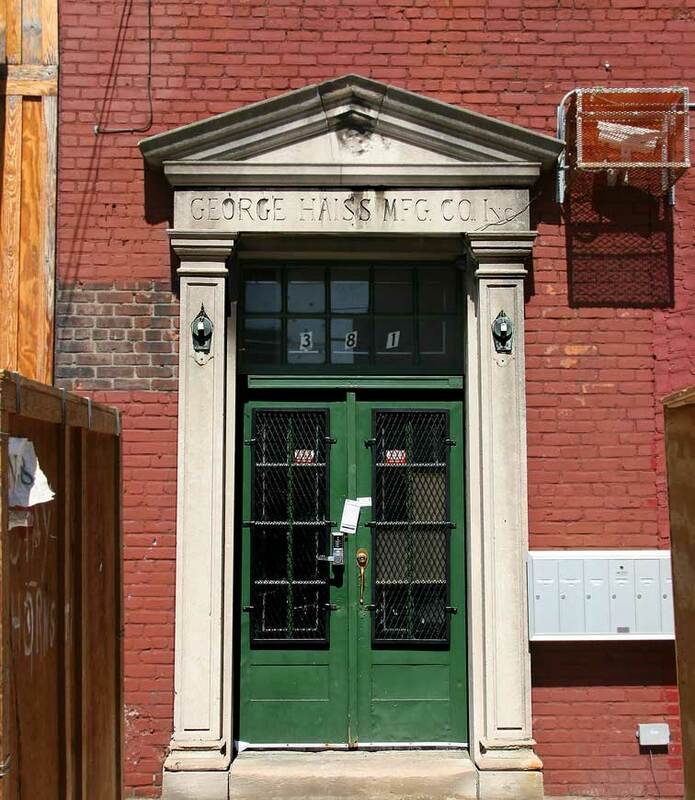 George Haiss Manufacturing Company Inc. was founded there in 1890 to produce clamshell buckets, conveyors and other coal loading equipment, and Haiss invented the bucket loader in 1913. Haiss was acquired by Pettibone Mulliken Corporation in 1946, and was still operating as the George Haiss Manufacturing Company with offices in New York City, Chicago, Illinois, and Rome, New York in the mid-1950s. It became the George Haiss Division and consolidated its operations in Rome by 1965, and either ceased operations or was absorbed into another unit of Pettibone in 1971." Haiss Brothers Coal was listed in New York city directories beginning in 1885. The brothers were Charles F. Haiss, Frank J. Haiss, and George Haiss. George C. Haiss (1895-1926) was born 22 April 1859 in Bethel, Sullivan County, New York, and died in New York City (the Bronx) 11 January 1926. In 1892/93 he established his company to manufacture coal handling machinery in New York City. The original location was at 1st Ave. and 34th St. This ad for George Haiss Coal Handling Machinery appeared in The Black Diamond, December 1897, offering Steam Shovels, Elevators, Conveyors, Revolving Screens, etc. Haiss also constructed coal plants. At this time Haiss was located at 351-353 East 34th St. at 1st Ave.
Around 1900 Haiss moved his operations to the Bronx. The 1900 New York telephone directory listed him at Rider Avenue and 141st St. (363 Rider Ave.). In 1906 The Iron Trade Review, 17 May 1906, pg. 34, reported on the incorporation of the company: "The George Haiss Mfg. Co., 141st street and Rider avenue, New York, recently incorporated, takes over the business established in 1893, but not incorporated. A new shop, four stories of brick, was erected last year, and the area of ground to work on was materially enlarged. The company is making a new departure in the manner of constructing coal pockets, using steel reinforced concrete throughout instead of timbers. About three-fourths of the company's construction work is in New York and its environs." This ad for George Haiss appeared in Cassier's Magazine, May, 1908. Rider Ave. at 141st St. remained Haiss' listed address until 1926, the year of George Haiss' death. After George Haiss' death, three sons took over the business. These were George Edward Haiss (1888-1961), Alfred William Haiss (1889-1979), and Raymond Charles Haiss (1891-1960). Apparently George E. Haiss was primarily responsible for running the business. A memorandum regarding a case in U. S. Tax Court, filed 1957, includes the following, "Prior to the sale by the Haiss brothers of the stock of the petitioner [George Haiss Manufacturing Company], George E. Haiss had been the most active of the brothers in the management and operation of the petitioner, having borne 70 percent of the burden of such management. Raymond was incapacitated by illness and Alfred devoted very little time to the business." Over time the Haiss operations, which included a Haiss Realty Co., and the GAR Realty Co. (for George, Alfred, Raymond), seem to have acquired a number of properties on the two blocks along Canal Place and Rider Ave. between 141st St. and 144th St. It was in 1926 that Haiss moved to 391 Canal Place, a block away from Rider Ave. 391 Canal Place was their address until around 1950 when the address changed to 381 Canal Place, the entrance to which is pictured above. Actual use of the facility may have preceded this date by many years. By 1950 the business was a division of Pettibone Mulliken Corp. In 1951 the New York Times reported sale of the Haiss properties on Canal Place, "In an all-cash deal involving about $450,000, the entire block in the Bronx bounded by 141st and 144th Streets, Park Avenue and Canal Place has been sold by the George Haiss Manufacturing Company to Spurgeon Tucker, Inc., lithographers, for the past twenty years at 52 East Nineteenth Street." (50-52 East 19th St. is the American Lithographic Building, home of many printers over the years.) The last listing for Haiss in the Bronx came in 1955. Several Haiss products are shown in this ad from Engineering and Contracting, July, 1922. The address given here is 143rd St and Canal Place, approximately the location of 381 Canal Place. The establishment date here reads 1892. The Haiss entry in Sweet's Engineering Catalogue, 1922, is available on google books. It also says, "Established 1892." This ad for the Haiss truck loader appeared in Engineering and Contracting, August, 1922. George C. Haiss secured numerous patents for his machinery - for example this one dated 1899 for a combination elevator and conveyor available on google patents. The three Haiss sons also were credited with patent registrations - for example this one dated 1928 for a wagon loader registered by Raymond Haiss. The Haiss Bros. coal yard began ca.1885 at 542 2nd Ave., New York City. George Haiss' brothers in this enterprise were Charles Frederick Haiss (1852-1911) and Frank J. Haiss (1857-1925). From approximately 1894 to 1900 Haiss Bros. shared quarters with Haiss Manufacturing at 34th St. and 1st Ave. When Haiss Mfg. left for the Bronx, the coal and ice business continued in Manhattan until Charles F. Haiss' death in 1911. Frank Haiss appears in census reports from 1910 until his death in 1925 working as a watchman and living in the Bronx.